My family and I got to try some of the best beef we have ever had last night. We cooked up a couple of New York Strip steaks on our Foreman grill, and “awesome” is the only word I can use to describe them. The directions said that they would cook quicker than a regular steak, and they definitely did. What surprised me was how tender these steaks were. Will (my 18 month old) is picky about meat. If it has a weird texture or if it is too hard to chew, he won’t eat it. However, he cleaned his plate off last night! La Cense Beef is 100% grass fed, and I have to believe that is what makes these steaks so good. Their steaks are lower in fat and calories than conventional beef too. It is also high in Omega-3 fatty acids (good for heart health) and low in the Omega-6 fatty acids (which can contribute to heart disease, cancers and depression). It is also has much higher beta-carotene in it. Lastly, La Cense Beef contains no pesticides, antibiotics or hormones. 1. Leave a comment on this post. 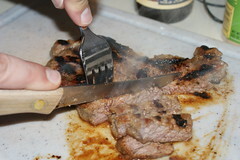 Check out the La Cense Beef website and tell me what you’d like to try. 1. Join the Grass Fed Party. Please leave me your username. 2. Blog about this on your blog. Please give me the URL, so I can verify. 3. Add this to any forums you belong too. Please give me the URL, so I can verify. Good luck! This contest will end December 31, 2008 at 8:00 PM CST and is for US residents only.